You may have come across an orange-tinged beer in the liquor store, with a meagre 2.5% alcohol by volume (ABV). This, my friends, is a Radler. "Radler" literally translated means "cyclist" in German, which may have something to do with the low alcohol content. It has become known as a cocktail consisting of a 1:1 or 3:2 mixture of beer and soda pop. There are several pre-mixed Radlers that have recently become popular in North America as well. These include the Schöfferhofer and the Stiegl Radler. Saturday in June 1922, when 13,000 cyclists descended upon his inn demanding beer. To quench the thirst of the demanding customers, Kugler was forced to dilute the beer with lemon soda, a previously unpopular ingredient in such a beer-loving province. He called the drink a "Radlermass" - radler meaning cyclist, and mass meaning a litre of beer. While the legend is somewhat plausible, there are references to the Radler cocktail that are dated several years before 1922. There are as many regional differences between Radlers as there are German dialects. 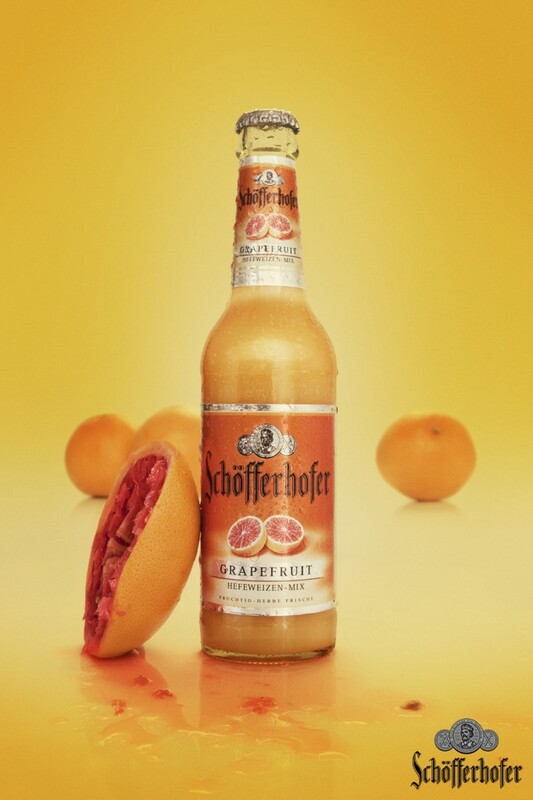 In some cases, the Radler is distinguished as using a lemon-lime flavored soft drink, while an Alsterwasser is mixed with an orange flavored soda. In some areas of Münsterland, they mix beer with an orange soft drink to make a concoction they call Wurstwasser, or "sausage water" to describe the color of the drink. Yummy. Let's talk about the noble grapefruit for a moment. There are several chemicals in grapefruit responsible for the bitter taste. The essential oil of grapefruit is dominated by two compounds - limonene and myrcene. There are many grapefruit flavors present in certain hops. Cascade hops in particular are notorious for providing the grapefruit flavor and aroma to beer. The essential oil extracted from Cascade hops is predominately myrcene (48.9%), while other abundant components include α-humulene, (E)-caryophyllene, (E)-β-farnesene. So although the two species are very different, they contain similar compounds that cause grapefruit and Cascade hops to resemble each other in flavor. Enter Alley Kat's Summer Squeeze Grapefruit Ale. This is an actual ale brewed with real grapefruit, and is a tad less sweet than a Radler. While the citrus bite is similar to that of the German beer cocktail, this is an actual beer with 5% ABV. This seasonal beer is brewed with real grapefruit, the natural flavor enhances the Cascade hops without masking the refreshing bitter finish. Get some before it goes back into Alley Kat's seasonal beer vault when the summer comes to an end. So I've made beer-sicles before, yes (see Fruits of YourLabour, June 2012). This is entirely different, I swear. Well, sort of. Pour beer into of the popsicle mould until each well is filled halfway. Make sure to pour down the side of the mould to minimize the level of foam. Continue to pour, filling moulds within ¼” of the top. Insert popsicle sticks and transfer to freezer. Share with friends who are over the legal age of majority. Nance M.R. and Setzer W.N. Volatile components of aroma hops (Humulus lupulus L.) commonly used in beer brewing. Journal of Brewing and Distilling Vol. 2(2) pp. 16-22, April 2011.